When choosing the finishing materials for your construction project, you should consider several different features of the product. In addition to choosing an attractive material that will give your home a sophisticated look, you also want to find something that’s easy to care for and highly durable. A cost-effective material may carry a higher price tag initially, but you’ll be rewarded with a product that can last for decades. Marble is one of the few materials that can meet all of your needs and may even exceed your expectations. It’s important to make the investment in high-quality marble that’s easier to install and maintain. You can rely on Nalboor for the most popular colors, meticulously crafted stones and excellent customer service. All marble is created by nature, but it’s not all created equal. Some stones are naturally stronger than others, and it’s vital for a manufacturer to know how to recognize the highest-quality blocks. While other manufacturers may be content to manufacture every available block, we take the time to find the highest quality stones that can withstand regular use and will provide you with decades of service. You’ll find that the installation goes more smoothly when you’re working with premium stones that are ideally suited to your purposes. When you buy from a local supplier, they may not be able to tell you where the stones were manufactured. They’re buying from wholesalers, and the marble may have passed through several stages of ownership before it reaches the final retail point. We’re a full-service company that handles everything from the manufacturing to the final sales. Our experienced manufacturers are highly skilled, and they take pride in their work. Stones that are meticulously crafted have a more consistent size and finish. They’re carefully inspected for structural flaws before passing to the next stage, and the edges are sanded smooth for safety. We pay close attention to detail so that colors are closely matched within each batch, and only superior stones are passed on to our valued customers. When you chose high-quality stones from a trusted supplier, you’ll spend less time sifting through the containers for good pieces and more time finishing the project. The quality of marble tiles depends largely on the manufacturers who take the raw stones and transform them into versatile tiles. We take pride in our consistency, and you’ll appreciate how much easier it is to care for a surface when the stones are the same thickness. The time and care we put into crafting stones at our manufacturing center means that you’ll have tiles that are easier to care for in the long run. One of the great features of marble is that it can be honed to a smooth finish that’s nonporous and more resistant to stains. This makes it the ideal choice for shower walls, kitchen counters, basements and other areas that have high humidity levels. 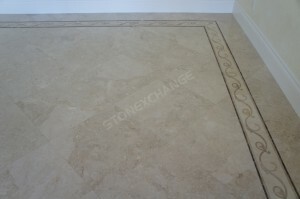 You can also give them an additional layer of protection by applying a sealer to the marble once a year. These finishes are very easy to care for, but they may prove too slick for use in most flooring applications. When you need a more textured finish for floors or outdoor projects, you’ll find that there are easy ways to keep the marble safe from harm. Our manufacturers take pride in meticulously smoothing stones to fill the pores and ensure that they’re ready for regular use. If you’re installing marble on the patio or your kitchen floor, you may want to go with a tumbled finish that will give you a little more traction. These stones have a slight texture that may trap dirt and water insider, but you can easily avoid this problem with a protective sealer. A quality sealer will soak into the pores of the stone to protect the surface while maintaining the safe finish. Reapply the sealer on an annual basis to keep the stones looking great now and for years to come. This simple step will allow you to install the marble where you want it most without having to worry about dirt and stains. In addition to offering quality stones, we also offer top-notch sealers that are perfect for preventing stains on nonporous or tumbled stones as well as specially formulated products that can seal the stones while adding a little traction for safety. When working on most large projects, you’ll have to cut tiles along the edges to make them fit. We take custom orders to provide sizes that will minimize cuts and grout lines, which is particularly important when you’re dealing with windowsills and thresholds. Most tiles are easy to maintain and keep clean, but the challenge lies in keeping the grout lines in top shape. When you minimize the areas of grout now, you’ll simplify the cleaning process later. We carry tiles in numerous sizes, and our manufacturers are more than happy to create custom stones that will be the perfect addition to your project. We require a few additional weeks to fill custom orders, but you’ll still enjoy excellent wholesale pricing and the superior quality that you expect. There is a minimum order amount for this type of work. Our customer service representatives are happy to see if your order qualifies and help you place it. Making the decision to use marble in your project is easy, and finding the right supplier can be even simpler. Our Miami distribution center is able to service the contiguous United States, and people all over the country appreciate our wholesale rates. We’re known for our quality tiles, and you’ll appreciate our great customer service. We have representatives standing by to help you place your order, so call us today for assistance.